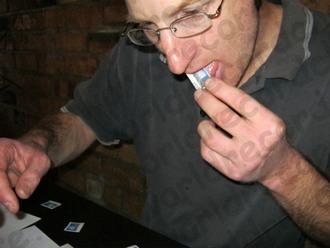 This is the story behind my Guinness World Record™ for the Most stamps licked in one minute. It's definitely not a good look to slobber in public. But I enjoyed it. Of course, the secret to that enjoyment was challenging myself to another world record. I'd practised for over a week at licking postage stamps. It had cost me more than a decent restaurant meal, but I didn't care. That's because I felt ready to speed through however many stamps were laid in front of me right then. I was with a world record adjudicator in a shopping centre entrance. The shop staff had laid out a row of tables and advertised that I'd be attempting several world records there that day. All around were posters advertising it. Customers stopped to watch me setting things up: placing stamp after stamp a set distance from the edge of the table, right side up, before placing a row of envelopes parallel so as to form a regular pattern. Slowly but surely a crowd gathered and children began to ask the questions I've learned to expect from them. So I had ready answers for the youngsters wanting to know how many world records I hold, what I was about to do, and where they could get the latest book. My stress was low, since this wasn't a high-pressure world record environment. Calmly, I waited for the timekeeper to click the stopwatch. And the instant they did, I was away – raising each stamp to my mouth and plastering it onto the ready envelope in quick succession. The way I'd practised meant I probably resembled some industrial machine repeating a monotonous process at speed. Time seemed to stand still as I scooped up each stamp, salivated as hard as I could, wiped its underside across my tongue, and slammed it hard onto the envelope's top right corner. Thankfully, I had enough moisture in my mouth to complete the run, even though dollops of the bubbly liquid landed everywhere as well as on the stamps! The timekeeper shouted for me to stop immediately, catching me in mid-cycle. That one wouldn't count, and I knew it, so I relaxed my stance. I could taste a little blood draining towards the back of my mouth: I'd given myself paper cuts on the tip of my tongue. Together with the spectators, we counted and recounted my handiwork, but nobody wanted to touch it. I beamed as I waited for the adjudicator to announce the result instantly. It was positive – I was awarded the new world record on the spot. Wow! Isn't that exciting. “Another one done”, I thought, while my mind was racing with ideas for the next possibility. I wiped slobber from both cheeks, my nose and my shirt. Again, I smiled at the staring onlookers, who were no doubt wondering about my sanity. But I wasn't bothered; hey, I was one world record better than an hour ago. Besides, they'd just seen truly unique live entertainment on their shopping excursion. And I liked that.